This meticulously researched yet engaging account traces The Salvation Army's history of service from its beginnings in Victorian England to its present-day mission in all parts of the world. A phenomenal religious movement, acclaimed for its compassionate service, The Salvation Army now works in no fewer than 118 countries, yet no contemporary book has chronicled this high-profile organization -- until now. Henry Gariepy's well-written, comprehensive account effectively fills that gap. 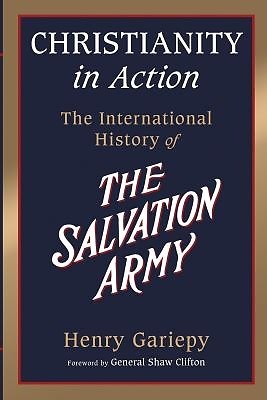 "To capture the exhilarating, almost 150-year history of The Salvation Army in one short volume seems an impossible task, but Henry Gariepy has done it with verve, color, inspiration, and challenge. At the end, one is filled with a sense of wonder at what God has accomplished through this resilient, Spirit-filled movement." -- General Eva Burrows, Rtd. "Scintillating. . . . Those new to the movement will find here a thrilling saga of Christianity in action." -- General Paul A. Rader, Rtd. "With his usual poignant word pictures, Henry Gariepy has unveiled the mission spirit and God-appointed plan to use this Army of Salvation for Jesus." -- Commissioner Lawrence Moretz, USA Eastern Territorial Commander "Buckle your seatbelts You are about to embark on an extraordinary journey through the remarkable annals of Salvation Army history. It will be difficult to lay Christianity in Action down." -- Commissioner William Francis, Territorial Commander, Canada.